You know those moments when the plan in your head fights it out with reality and you have 2.5 minutes to leave the house? Those are moments that can defeat you or define you, depending on how you choose to handle them. For example, let's flash back to one of those moments Monday morning as I was preparing to leave the house to drive to Huntsville for my uncle's funeral. Let's also flash back a wee bit farther to Friday afternoon when I was at Target and deciding between two sizes of an uber cute dress marked almost 50% off. As I attempted to zip up the awkward side zipper Monday morning, and had to call in Scott for additional zipper technical maneuvers, I realized I had made the wrong call between the two sizes. Now I was in one of those defining moments and had to make a decision between fashion statement, pride and personal comfort. It was also almost past time to leave the house. Knowing me as you do, what do you think I did? That's right, I tossed on an elbow length sleeved lime green cardigan, since the dress was sleeveless and to disguise the fact the evil side zipper was barely 3/4s of the way zipped. Add some long pearls, ballet flats and I was set. Then I had the perfect opportunity to practice my shallow breathing techniques and tried not to hyperventilate as I crawled my way through Houston rush hour traffic in the rain. Fashion, of course, had won. Or maybe pride was the victor after all. What would you have done? Have you experienced a defining fashion moment where you've had to make a tough call? what an excellent fashion macgyver moment! You look good, you feel good. Isn't that what they say? Excellent choice! I would have done the same thing. That necklace is awesome!! Ummm...maybe I'm seriously considering purchasing a bella band (made for pregnant ladies) so I can wear all of my pants that only "mostly" fit me right now, unbuttoned of course. Where can we get that necklace?!?! Amy: I bought that necklace at Target a few months ago. 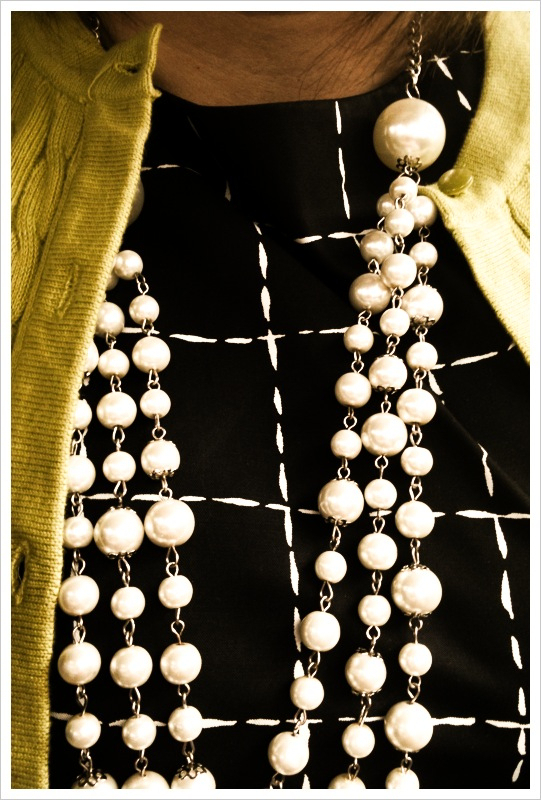 Can you believe long pearls are back *in* again? Go 80s!! I saw some tied in a knot and had a bad flashback! I haven't had a "moment" recently but I will admit my worst wardrobe "moment" was with my mermaid style sleeveless wedding dress. We were supposed to get married in October and then changed to Dec. due to a health issue with my husband's mother. Well, I guess between Oct and Dec I "gained" a little and my wedding dress was snug. I didn't even think to try it on until the day before we got married. I sucked it in the whole entire day. My husband says "Well, at least you were standing very straight in every picture." ha! I have made that call before and lived to regret it. My psyche can't handle the charade and I end up spiraling into an identity crisis, so now I just avoid those moments all together. Of course, I'm not very fashionable, so it isn't a hard choice. I would have changed, because I would have been self-conscious about the fit and that would have drawn more attention than I wanted anyway, I think. Even though I would have hated to do it. Nicole: You are right, I probably should have changed, but I was running late and feeling exceptionally stubborn about the dress.